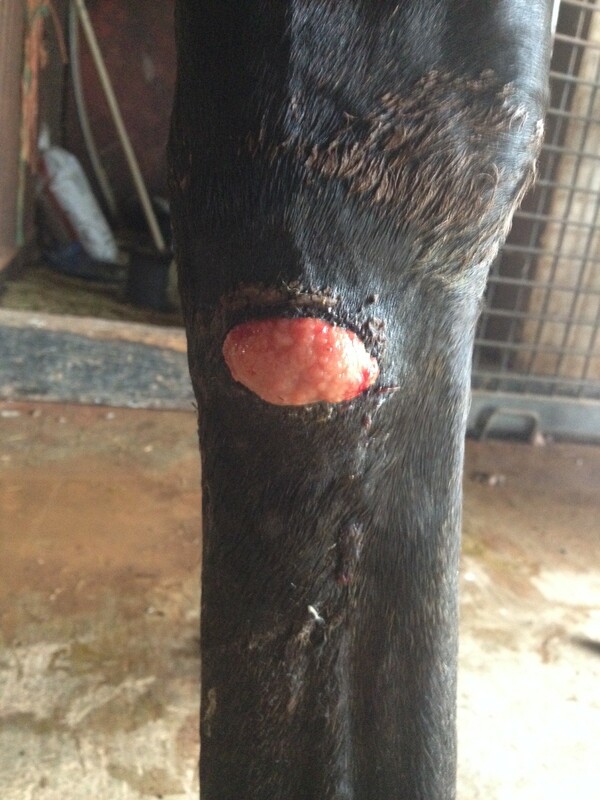 The other week one of my mares came in with a cut just below her knee. She had just gotten a new pasture-mate, so I assumed there would be some bumps and bruises from them establishing a pecking order. We kept it clean, gave her some SMZs because it was starting to look infected, but at the end of a month it was no longer a cut, but proud flesh. Proud flesh is where the body grows too much granulation tissue, the tissue the body uses to ‘fill in’ the wound, protect the underlying structures from infection. This tissue does not have many nerves, but has a very active blood supply, and will bleed profusely. Proud flesh usually occurs below the knee or the hock. These areas have an increased amount of tension on the skin, making it more difficult for the skin to grow back, and making it much easier for proud flesh to develop. Depending on the severity of the proud flesh, a veterinarian may be able to surgically remove the proud flesh and a pressure bandage applied to stop the proud flesh bleeding, and encourage the skin to grow. This procedure may have to be done a number of times. Several caustic substances are available through your vet or local vet supply store. The caution with caustic substances is they’re designed to destroy cells, and you risk destroying healthy cells as well. Honey and bandage. I have had tremendous luck simply applying honey to the location, protecting it with a non-stick gauze (bought at CVS) and wrapped cotton and vet-wrap. Honey is a natural anti-bacterial and promotes healing. Depending on the size and the underlying structures involved, you may just be looking at a small scar or white hair patch. I definitely recommend consulting with your vet first and foremost, before deciding on any treatment.